The following diagram is our topic map for color space theory. Please have a quick look at it to see what's expecting you. Color space theory is important for accuracy, precision and quality assurance. Therefore, it's an important foundation for good craftsmanship. Let's begin with building the abstract knowledge framework before diving into particular matter. and in its space one point corresponds to one specific color. Actual color perception of the 36 value sets of this relative color space varies on different monitors with different hardware configuration. With the properties of a color model alone, however, we can only determine a certain color relatively to other colors of the color space. That means we can't assume yet how a certain color is actually perceived. What we have is just a color components value set which can stand for different colors in different contexts. To determine a certain color absolutely a reference to the standardized human vision color space is required additionally. The reference is obtained by quantification resulting in a context specific conversion formula. With this conversion formula all colors of a relative color space can then be expressed in terms of colors of the human vision color space and a color components value set represents the context specific, actual (absolute) color perception. A "true / absolute" color space requires a specification of the color space's white point. Screen color spaces additionally require a specification of the assumed gamma value. Color model components (~ relative color space dimensions) have several distinguishing features. The most important being the component type (e.g. hue, red primary) and its unit (e.g. degrees, percent). Another feature is the type of scale (e.g. linear, non-linear) and its intended number of values referred to as the color depth. Furthermore, the minimum, maximum and "standard" value of a component can be modeled differently. subtractive color mixing ("subtract from white"). The configuration of a color model determines some important attributes of the resulting relative color space. A striking such attribute is certainly the dimensionality, determined by the number of color model components, which can range from one-dimensional to (theoretically) infinit-dimensional. Another attribute determined by the color model is the relative color space's geometric shape. This attribute is related to dimensionality since, for example, a line, a square or a cube are one-, two- and three-dimensional respectively. The geometric shape tells you, what the map for navigating a relative color space looks like. Color models also constitute four distinctive points in relative color spaces. Two of these points have a variable location among relative color spaces. The darkest point (~ black) and the lightest point (~ white). The other two points make up a variable color impression among relative color spaces. The points where all components have their lowest intensity or highest intensity. The construction of a model usually follows the aim of solving a real world problem. This implies that attributes and interrelationships of a real world setting must be considered. In context of color, prominent real world problems can be categorized into: apply, select and determine color. 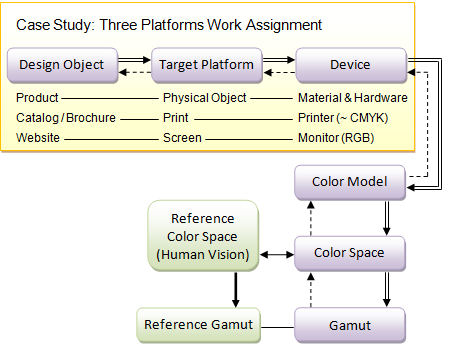 Prominent real world settings are represented in target platform categories: screen, print and physical objects. In combination, these two categories form particular sets of requirements. In the subsections we'll explore, with what solutions bright minds have come up with to address these requirements. In general, gamut is the range of something compared to its reference range. Range meaning "the area of variation between upper and lower limits on a particular scale" (oxforddictionaries.com, 12/15/2011). Note that only the two outer points determine the gamut. It doesn't matter how many points there are in between. A narrower / broader gamut doesn't necessarily include less / more points. Note that the meaning of gamut has been extended to "the gamut of one component (in one dimension) and any or both of the two directions from the center". Note that the meaning of gamut has been extended to "the gamut of two components (in two dimensions) and any or all direction(s) (in 2d) from the center". From the general concept of gamut we can now move on to the meaning of color gamut. 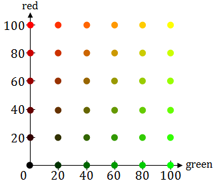 The term color gamut is used in connection with color in absolute terms and the reference for absolute color is the human vision color space. Human vision colors can be defined with a color model which consists of one achromatic component and two chromatic components. And the two chromatic components define the two-dimensional space in which the color gamut is typically determined. What are the attributes of the reference gamut? The central point of the reference gamut defines the minimum chromatic intensity (~ impression of white) and the border around the reference gamut defines the maximum chromatic intensity in all directions. A set of colors of an absolute color space is usually located inside the reference gamut. For each direction from the central point, the colors with the lowest and the highest chromatic intensity value determine the color gamut of this set. The chromatic intensity (chromaticity) of colors is important because it's a limiting factor in color reproduction. If a real world color is of high chromaticity it might not be reproducable. What does the color gamut tell us? In color reproduction, e.g. for electronic devices or a set of paints, it tells us about the potential chromaticity reproduction capability. For input devices it tells us about the potential chromaticity processing capability.